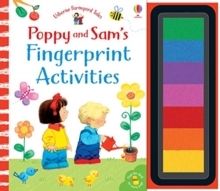 Join Poppy and Sam for lots of fingerprinting fun in this entertaining activity book, with its own brightly coloured inkpad of seven colours. Decorate the scenes with flowers, chicks, piglets, rabbits and much more. There are simple instructions showing how to fingerprint each scene and the book has a spiral binding so that it lies flat.